For a limited time enjoy a 12% discount with this code at i-Supplements.com. Click link to get started. 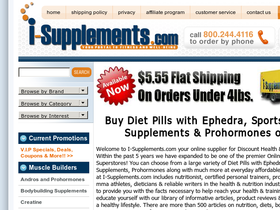 Act now to save 5% on your entire order from i-Supplements.com. Click here for coupon code. Click here and check out the clearance items at i-Supplements.com and find savings up to 75%. Save big on your supplements from i-Supplements.com. We saw savings up to 50% off regular retail prices.